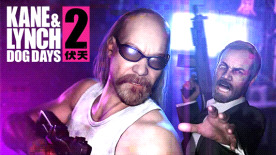 Play as two of gaming's most disturbing and realistic criminals; Lynch, a self medicated psychopath, and Kane, a disillusioned and desperate ex-mercenary, in a gritty and brutal crime shooter from IO Interactive. Kane and Lynch face the consequences of their actions when a simple job gone wrong finds them on a desperate and frantic struggle to escape. Experience their fight to survive through the back streets and rooftops of Shanghai's gritty underworld. They can trust no one, not even each other as the cracks begin to appear in Lynch's sanity and Kane’s stability. Non-stop action in Single Player, online Co-op and Multiplayer. New and unique Fragile Alliance multiplayer game modes provide an experience to suit all criminal minds. Raw, Real & Uncut: Kane & Lynch 2: Dog Days introduces a unique, unseen visual style to video games. Taking visual references from documentary filmmaking and the user-generated era, Kane & Lynch 2 delivers a sense of intense realism never before experienced. Play as Lynch: Play as Lynch and follow his story. He is living a comfortable life in Shanghai, he’s making money and is about to make a fat deal where the pay is beyond his wildest dreams and nothing is going to get in his way. Down Not Dead : Adding further intensity to the brutal gameplay, players will have a second chance at taking out their enemies; Choose between continuing the gunfight from the ground or try to escape by crawling towards cover. Fragile Alliance : The highly celebrated multiplayer experience returns with a collection of new and improved modes. From the Creators of the Critically Acclaimed Hitman Series : The studio behind the best-selling Hitman titles and 2007's Kane & Lynch: Dead Men. Copyright Square Enix Ltd 2010. All rights reserved. SQUARE ENIX and the SQUARE ENIX logo are registered trademarks or trademarks of Square Enix Holdings Co., Ltd. KANE & LYNCH 2: DOG DAYS, EIDOS and the EIDOS logo are registered trademarks or trademarks of Square Enix Ltd. IO and the IO logo are trademarks of IO Interactive A/S. All rights reserved.